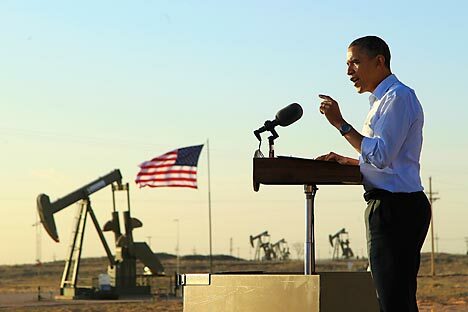 President Barack Obama’s laudable commitment to reducing imports from the Middle East could also aversely affect Russia by reducing the price per gallon. In the next eight years, the United States expects to reduce oil imports from the Middle East by half. By 2035, American leaders hope to stop imports from the Middle East entirely. New technologies, shelf drilling and oil extraction from oil shale and tar sands could allow this to happen. The strategy will affect both the American economy and its foreign policy. But this strategy could hurt Russia's pockets, experts say. Analysts suggest that U.S. commitment to oil reduction will reduce prices for some exporters--including Russia. Oil at $200 a barrel? According to predictions made by the U.S. Government, the country will have cut its import from the Middle East, Africa and Europe from over 4 million barrels to 2.5 million barrels a day as soon as 2020. Export from the OPEC countries will drop from the current 1.6 million barrels to 860 thousand barrels a day. It sounds remarkable, but even some OPEC analysts agree that the United States may well break free from its yolk to the Middle East and stop importing oil by 2035. Domestic oil production has been actively supported by investment. According to IHS Cambridge Energy Research Associates, 48 percent of the global investment in oil production ($320 billion) comes from the United States and Canada. New technology reducing the cost of extraction will also introduce significant changes to U.S energy policy. The presidential administration stressed that, despite its cutting oil import from the region, the Middle East will remain at the center of the country’s foreign policy. “The continuing stability of the market is in our best interest,” said Carlos Pascual of the State Department's energy bureau. Today oil prices in the domestic U.S. market is $83 per barrel, but this could be reduced to $65 by 2013. Middle Eastern oil exporters will not lose their market share however. The demand for energy resources is growing both within the region and in the neighboring Asia. It is no coincidence that Saudi Arabia and Kuwait are contributing to the Asian oil refinery construction projects where the Middle Eastern oil will be refined. The Chinese will become an important consumer among others. At the same time, the new American strategy has already proved to be disadvantageous to many other oil exporters. “A significant drop of quotations could be devastating for the counties outside of the focus of the U.S. policy. That is especially true to Iran, Venezuela and Russia who were just a while ago forming their budgets in reliance on the oil price of $100 to $120 dollars per barrel,” Guseinov said.